Students put their hands up during Andy grammer’s set. Photo by Katelyn Edwards. Jesse McCartney, Andy Grammer and T-Pain played at the first Recess at RenCo hosted by ACBU last Saturday. 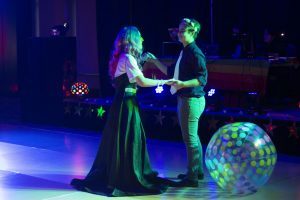 ACBU featured entertainment coordinator Dylan Pashke said ACBU was hoping to attract a wide audience with the selection of these specific performers. 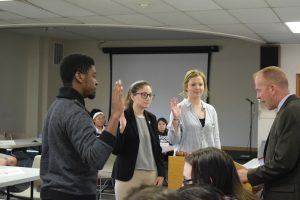 “We were trying to appeal to as many Bradley students as possible, but then also connecting them through kind of like a throwback,” Pashke said. 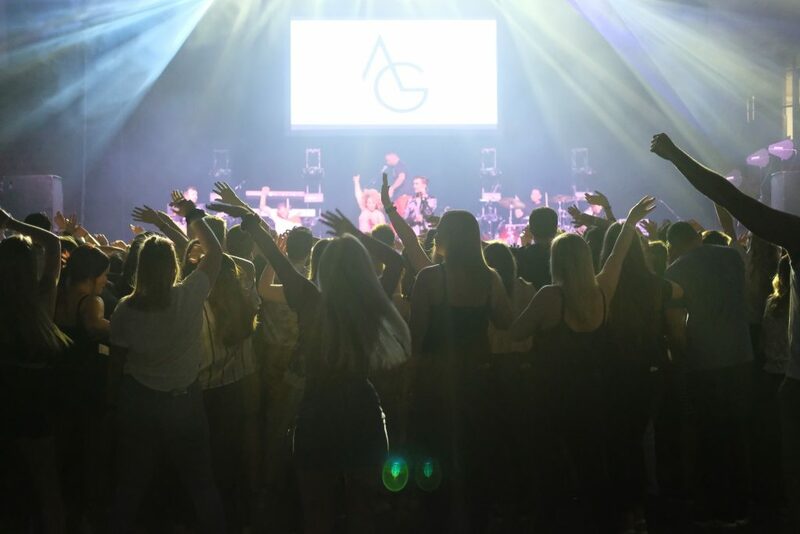 In the past, ACBU has brought only one headliner for its spring concert. This year’s first Recess at RenCo featured three. Each artist had an hour-long set and played their greatest hits as well as covers from other artists that have impacted them. McCartney often offers a meet and greet at his venues, and Bradley was no different. According to Pashke, the Peoria community was interested in the chance to meet McCartney. McCartney started his set with his 2004 classic “She’s No You.” His guitarist, Dory Lobel from NBC’s “The Voice,” pulled out an acoustic guitar for the fifth song of the set, “Just So You Know,” while people in the crowd swayed the flashlights from their phones. The next song was a cover of “Stupid Things” by Robin Thicke and McCartney invited one lucky fan on stage to sing to him. McCartney also sang the song “Bleeding Love,” a song he wrote, that Leona Lewis made a hit in 2007. He mentioned that he had no intentions on making any new music but changed his mind once his single “Better with You” was a success in 2018. He tried closing his set with another 2018 song, “Wasted.” However, he had to return for an encore because the show would not have been complete without the tune that made him famous, “Beautiful Soul.” Many were singing the lyrics that transported them back to their childhood. He went into the crowd during “Kiss You Slow” before flipping over the railing to run back to the stage. T-Pain’s set was delayed due to a complication with his flight, but the audience screamed as he finally made his way to the stage. He ended his set with “All I Do is Win” and an inspirational message that relates to his new album “1UP.” T-Pain said to keep on getting better at what you’re doing and to one-up everything else you’ve done. Pashke said he was happy with the audience turnout.